The past two days and mornings on the Suwannee had been pretty nice. This morning, not so much. The alarm went off at 4:30 and my muscles were stiff, it was dark outside and the river was starting to mist. I carefully got out of my tent so that I would not lose my balance and fall into the river. I don’t know if it was because I was sleeping on an aluminum dock versus a nice sand bar or it was the difficulty of packing the boat off a steep bank which meant I had to get into the river to pack the boat. Maybe it was the fact that I had to put on my cold wet paddling clothes. The mist off the river wasn’t that bad but the clothes didn’t dry one bit during the night. Maybe it was just an accumulation of things but for the first time the thought hit me… “I am getting tired of this.” I was finding myself longing for the day when I would be waking up in a nice warm bed, in warm dry clothes, knowing a nice cup of hot tea waited for me in the kitchen. Ahhhhhh, the comforts of home. Enough of that, it was time to get underway. Rod’s feet were doing pretty well which was a relief. No infection and they were healing. 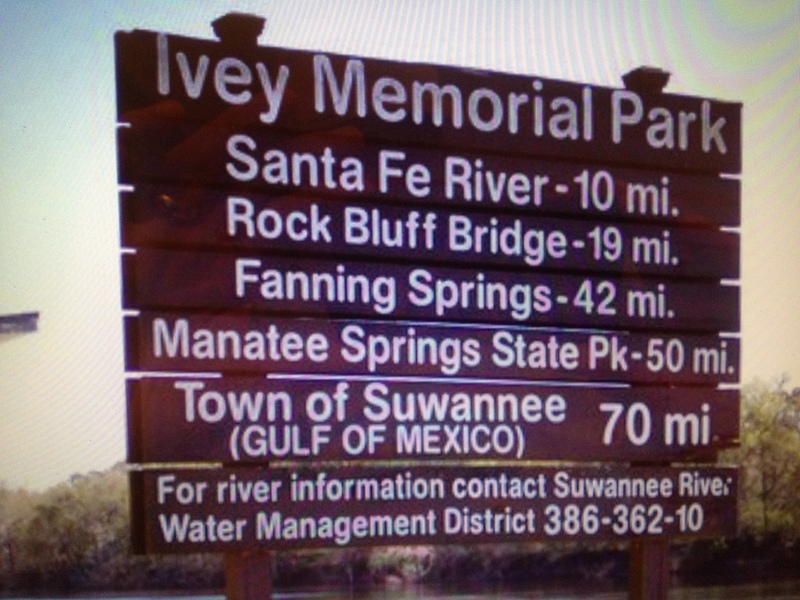 As daylight came about, we saw that we were approaching a park called Ivey Memorial Park. At this park I found this sign which was a moral boost because it showed that we were close enough to the Gulf of Mexico for them to list the distance to it. Yes, it is 70 miles, but the fact that the Gulf Of Mexico is showing up on signs means progress. In addition to this sign there were some nice outhouses and oh, did I mention some convenience stores? Who knows, maybe a breakfast sandwich would be possible. 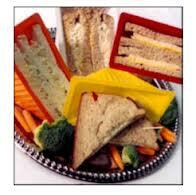 I have never thought of those package sandwiches at the convenience store food as being very good and, in fact, I figured they were a sure path to a very upset stomach. Well, at this stage if the trip I had a whole different prospective on them and that was they looked delicious. I even went for the tuna and egg salad ones. Were they out of date? Couldn’t tell you because I didn’t look. Oh, and they had coffee, payday candy bars, Snickers, and orange juice. We were eating good. The stop and the fresh food were what I need to get out of my grumpy mood and enjoy the rest of the day paddling on the river. This part of the river we were paddling was very pretty and the time did pass fairly quickly. We were making good speed over ground thanks to the current. As evening was approaching we were also approaching a town called Fanning Springs. 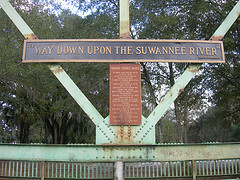 This is the sign that is on the bridge at Fanning Springs. Both of us were low on water so we decided to stop at a local park that was near the bridge. We were in luck as the bathrooms were open and not only provided a water source but provided another missed luxury. A toilet! With our water containers filled and our personal needs taken care of, the only thing that would make life better would be a nice dinner. Was it worth the risk of a short walk to see if there was a restaurant? Rod said his feet were up to it and after several days of dehydrated meals a fresh cooked meal would be good. 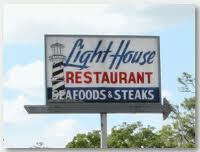 Well luck was with us and we found a local restaurant right on the main road. At first I thought it was closed because no one was in the place. Not only was it open but there was a salad bar with fresh fruit. The waitress was great. In fact, everyone we met in small towns was fantastic. This waitress even let us use her cell phone to call home. I have often wondered what people said about us after we left the restaurants we visited. Both of us looked like a homeless person and we ate like we hadn’t eaten in weeks but they were always nice to us. Maybe there is a lesson to be learned there. After our meal it was back into the canoes with the goal of going three more hours. The banks of the river were changing again. Now they were going from steep banks to flat areas that were marshy and had a lot of tree roots. Not a great places to try to pitch a tent. The aluminum dock was rough but tree roots would be another whole level of roughness. I was afraid it was going to be another tough night finding a camp site. As we rounded a bend we saw some small sailboats anchored on the side of the river and a fire going on the bank. I wonder how much bank is over there. Well luck was with us big time today as we were able to find a spot about a quarter of a mile away from the other boats. Even though the start of the day was kind of bummer it was finishing off pretty nice. The camp site was a nice one and the sleep was going to be a good one. Little did I know how much I would need that sleep for the upcoming day.